All of us who follow Christ and have surrendered our lives to Him are now the spiritual Mount Zion. We cannot be shaken, we endure forever. We are God’s house, His home. Our job is to shine. Our destiny is to carry His glory, to be like Moses who had to veil his face because the people couldn’t handle his glow. We are predestined, chosen before we were born, and designed for his glory. Think about that. The One who made us designed us to hold His glory. We are being conformed into His image. 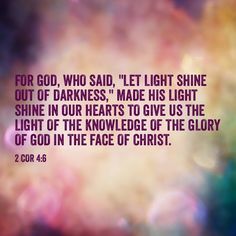 The closer we get to looking just like Him, the more of His glory will be revealed in us and on us. We are vessels that have to go through the process of firing so that we are strong enough to hold His glory. The Father’s intention is to present us as a bride to Christ. A bride that is without spot or wrinkle, one that is holy and blameless, a glorified Church. Each designer has a purpose in mind when they design something; sometimes it is just to look good. However, if you have ever purchased a pair of shoes that looked great, but were so uncomfortable you had to give your feet a pep talk before they would agree to wear them, you know that looks aren’t everything. God didn’t design us to shine just so we would look good! He wants us to lead people to Him. A light house shining in the darkest storm, the flood lights that light up that stage, the soft glow of a candle that brings hope and light in the darkest night. That’s us. Or it should be. Accepting His love for us is the beginning, then once we are truly motivated by a real love, not just a mindset to love, but genuine passion for Him, then we can do good works that stand. Those works won’t be worthless, sounding brass, or a banging cymbal (I Cor 13:1). What does a light house look like to those in darkness? A place where they can come in and be judged? A place where they feel threatened and forced to conform to a set of behaviors and standards? How about a place that is just like the darkness they want out of? No! A light house is a place of safety, a safe haven in the midst of the storm. The church is a family, one that is so full of love they just can’t contain it! It is shed abroad in their hearts by the Holy Spirit and just flows out of them, especially to those who are hurting and lost. We aren’t sent to condemn or judge. We are not called to follow the law, we are called to love, we are sent out to Shine! I challenge you to search out scriptures about Mount Zion. Then meditate on them. Stir them around in your heart and keep in mind that us believers are spiritual Zion. Good things come from there, people meet God there! This entry was posted in Thoughts and tagged Bible, Christianity, designed, destiny, faith, God, God's love, God's word, Holy Spirit, Jesus, love, Salvation, scripture.